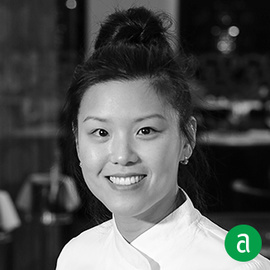 Aggie Chin, Executive Pastry Chef of Mirabelle in Washington, D.C., shares her career timeline and advice for up-and-coming talent. Being clean and organized is crucial in this profession. You are constantly working against the clock and trying to be as efficient as possible. The more organized you are, the faster you will be. Rely on muscle memory. This can be an incredibly stressful profession, so finding a positive outlet for stress is also important. The healthier you are, the longer and further you can push yourself. When looking to hire new cooks, I always look for people with a great attitude. I will gladly take someone green who is positive and proactive. You are spending 10+ hours a day with the same people day in and day out; the dynamic and energy within the team is very important. The one thing I can’t do my job without is a scale. Everything is measured and scaled out, so it’s crucial for every recipe. A close runner up would be my phone; If someone could come up with an app that turns your phone into a scale, it would be a gold mine! Working at Palena was truly an amazing experience. I was so fortunate and spoiled with an amazing boss, the kitchen, my team, the supportive guests, and the scope of what we were able to accomplish on a daily basis. It was a special place, not only for myself, but for so many others as well. Even now, people will recall specific dishes they had or occasions they celebrated there. I learned so much - how to manage a team, how to write menus, what my style is, and essentially, what it meant to be a chef. What has made a lasting impression on me is the knowledge that if something is really that good, they’ll always remember it.